Amboseli National Game Reserve is 392 square meters in size; forming the core of the 8,000 square kilometer ecosystem that spreads across the Kenya-Tanzania border. The park is famous for its Elephants; some 2,000 live there in harmony with the other infamous feature, the indigenous Maasai people. Here in Amboseli, the Maasai tend their animals and live traditionally, as they have for centuries. The park is located 240 kilometers southeast of Nairobi; it is the second most popular National Park in Kenya, after Maasai Mara. 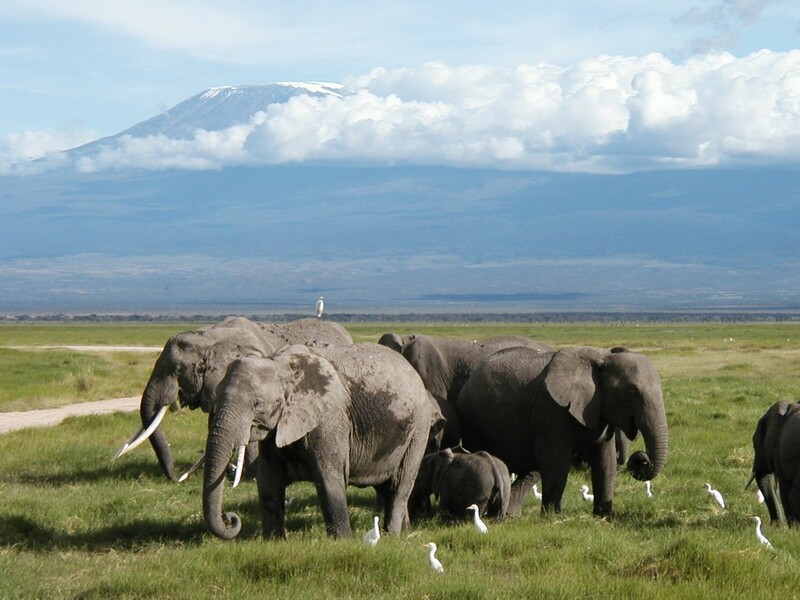 Amboseli has the largest population of free-ranging elephants; but it is equally famous for its spectacular views of Mount Kilimanjaro, the highest free-standing mountain in the world. Kilimanjaro is located across the border in Tanzania, but the best viewing is from the Kenyan side. Amboseli offers some of the best opportunities to see African wildlife, including Cape buffalo, impala, Maasai Lion, Tanzanian Cheetah, spotted hyena, Maasai giraffe, plains zebra and the blue wildebeest. The swampy areas are full of hippos with their associated birdlife, with whom they co-exist. There are very strict rules in Amboseli for visitors; never to get out of the vehicle, except in designated spots, no harassing the animals, no off road driving – basically the animals have the right of way always.